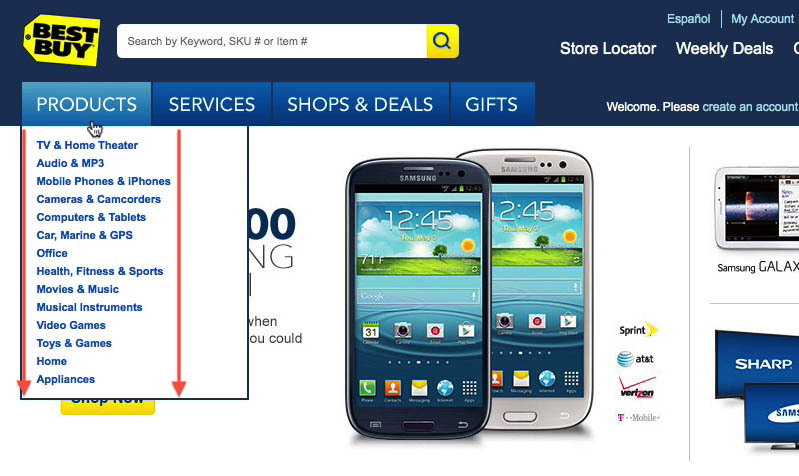 BestBuy navigation example from the Homepage & Category Usability report. Product finding is key to any e-commerce business – after all, if your customers can’t find a product they can’t buy it. We therefore set out to conduct a large-scale usability study on the customer’s product finding experience. Despite testing 19 major e-commerce sites, abandonments were common and subpar user experiences were the order of the day. The test subjects had trouble finding products matching basic criteria, such as a sleeping bag for cold weather or a spring jacket, and task completion rates hovered as low as 10-30%. It quickly became clear that it doesn’t matter how much time you spend on beautiful design, product images and landing page optimization – the customer’s overall e-commerce experience will falter if foundational elements such as the category taxonomy aren’t solid. Indeed, the repercussions of a poor category taxonomy can be even more devastating than immediate site abandonments – it may lead to permanent brand damage. When the test subjects couldn’t find a particular product type, they would often conclude that the site simply didn’t carry those items. Such fundamental misinterpretations not only lead to an immediate lost sale, but also numerous future losses, as customers are obviously unlikely to visit a store they don’t expect will carry the type of product they are looking for. In a time where more and more customers access e-commerce sites from search engines and social media links that send them deep into the site’s hierarchy, the ability to infer the current hierarchy scope, the breadth of the site’s product catalog, and to find related content is critical. And while the homepage may not be the predominant entrance path it once was, it still serves a central role as an escape route and anchor for the site’s category taxonomy. Even the customers that use on-site search will depend on the site’s category taxonomy to infer the available product range. However, designing a user-friendly homepage and category navigation is not an easy task. It requires solid information architecture, systematic labelling and hierarchy, curated sub-category pages, and balanced homepage design - and that’s just the beginning. We’re therefore excited to release a new e-commerce usability research report on the intricacies of homepage and category usability. The 300-page report features 79 concrete design guidelines on how to build and maintain a user-friendly category taxonomy and homepage design, so your customers can find the products they are looking for. 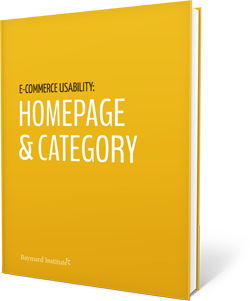 Learn more about the Homepage & Category Usability report. Authored by Baymard Institute. Published on October 15, 2013.